Several of my stock brake lines were showing signs of age (cracks) so I decided to replace all lines. Since I had lifted the 80, I made an educated guess at adjusting the LSPV after the lift installation. I was never quite sure where I was with that, however after going through a set of rear brakes and several adjustments, I knew it was wrong. I also needed to replace the front pads (running 100 series pads). I decided I would adjust the LSPV before replacing the brake lines. 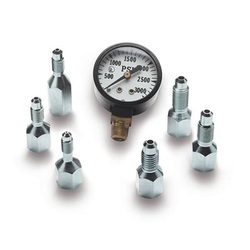 In researching a solution to setting the rear brake pressure, I came upon a neat brake pressure gauge with a set of adapters from Summit Racing. It is part number SSB-A1704 for $45.95. I removed the bleeder from the RR caliper and installed the proper adapter and gauge. A friend applied the brakes (engine running) and I found that I only had 300 psi at the rear. After adjusting the LSPV, I had 800 psi at the rear and 1500 psi at the front. Close enough! IMHO, this is the only way to really know what that LSP valve is doing to your brakes. My first error was in ordering a set of braided lines from a firm in Californina that shall remain nameless. After removing the RR line and attemtping to install the new one, it became obvious that the end of the brake line that drops into the tab on the axle would not seat. The hex on the line was too large. I called the tech service number of the company and they informed me the "Oh yea, sometimes you have to grind out the openings to get them to fit". I returned the lines and discovered Christo sells brake lines. Should have looked there first. In a couple of days I had my new lines from Christo. They are top quality and fit perfectly. During installation, I attempted to keep the reservoir full as the system drips while removing and replacing the lines. I may have let the reservoir run dry while attempting the first line that did not fit properly. In any event, after replacing all the lines (seven in all) I was ready to bleed the brakes. I had a friend pump the brakes and used Landtanks sequence method (RR, LR, LSPV, RF, LF). During the bleeding process (and I spent a great deal of time reading horror stories on MUD about this), I did get some air from the LSPV and calipers. After all fluids were running clear (used about a quart plus of fluid) I decided to give it a test drive. The brakes were spongy from the start. I suspected I had a small amount of air in the master cylinder as it is slightly tilted up as it is installed. I drove to an area that has a steep embankment, drove the cruiser off nose down about 30 degrees and parked. I released the brakes and pumped several times and no more spongy brakes. I am convinced the problems many have with spongy brakes is a small bubble in the M/C that will float back to the reservoir in the right attitude. Now I have new lines, correct adjustment of the LSPV and great brakes.